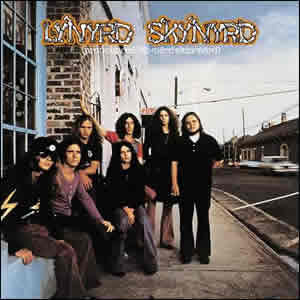 Lynyrd Skynyrd burst onto the national scene with their 1973 debut Pronounced ‘lĕh-‘nérd ‘skin-‘nérd, which not only featured many of the band’s most popular songs but also defined the genre of “Southern Rock” more than any other album. This six-piece group out of Jacksonville, Florida fused blues, country, and straight-forward rock to forge an edge that is totally unpretentious and unassuming. Produced by Al Kooper, there are few debut records which express such confidence and drive, with a balanced diversity between upbeat honky-tonk rock and the delicate jam songs, which would Be the prime templates for the “power ballads” which proliferated a decade or more later. The grouped was formed nine years earlier, in the summer of 1964. High school friends Ronnie Van Zant, Allen Collins, and Gary Rossington formed a band with two other friends called “The Noble Five”. Through many personnel and name changes in the late 1960s, these three remained the core. In 1970, the band changed their name to “Leonard Skinner” as a tongue-in-cheek tribute to a strict phys-ed teacher at their high school in Jacksonville, who constantly harassed them because of their long hair (which played a big part in Rossington dropping out of school). The more distinctive spelling was adopted at the suggestion of Kooper in 1972 when he signed the band his Sounds of the South, a subsidiary of MCA Records. The band had grown notoriety by opening for the band Strawberry Alarm Clock and that band’s guitarist Ed King joined Lynyrd Skynyrd to play bass on the debut album (later switching back to guitar, giving the band three guitarists). One day the band was playing a high school prom when their then roadie Billy Powell played what would become the intro piece to “Free Bird”, the band’s most famous song. Powell was immediately invited him to join the band as keyboardist and the classic lineup of Lynyrd Skynyrd was established. The moody ballad gives way to a frantic ending jam led by the dual guitar leads and ever-more creative ways to grind out the three backing chords and even contains a drum roll by Bob Burns that lasts nearly a minute. The song completes the band’s debut album in climatic fashion. The album begins with some backward percussion effects that introduce “I Ain’t the One”. Although this intro is rather awkward, the song finally catches its groove with the Rossington riff and piano embellishment from Powell, saving the song from bring too ordinary. “Tuesday’s Gone” then provides an immediate contrast to the opener, instantly displaying the band’s range and penchant for differing moods. The great harmonized guitars throughout serenade the lyrical theme of changing times with guest Robert Nix filling in on drums and producer Al Kooper providing bass and Mellotron. Aside from the later hit “Sweet Home Alabama”, “Gimme Three Steps” may the be the quintessential Southern Rock song for all time. Led by a great riff sequence by Collins and just the right amount of lead guitar activity between verses, the storytelling song became the band’s first charting hit. The lyrics are based on an actual experience by Van Zant in a biker bar in Jacksonville when he had a gun pulled on him. That bar was actually called The Pastime Bar, but was renamed “The Jug” (from the song’s lyrics) in September 2012. “Simple Man” finishes off side one as a rather “simple” song, which somehow stretches three chords for nearly six minutes, using some sonic dynamics which saves it from getting too mundane. Aside from the closer, side two contains some lesser known yet interesting tunes. “Things Goin’ On” at times seems a bit and unsure of itself, especially due to its lack of a strong beat, but the song contains some very entertaining elements such as the alternating instrumental leads between Rossington and Powell. “Mississippi Kid” is the most unique song on the album while being a definite nod to southern blues. It was constructed by Burns and producer Al Kooper, who also adds the signature mandolin while Ed king plays a respectable slide for his only guitar part on the album. “Poison Whiskey” is a short, funky song with more use of the nice double guitar harmony by Rossington and Collins. A shortened version of “Free Bird” was released as a single and the full song received heavy airplay for decades to come. After the band’s devastating plane crash, which took the life of Van Zant in 1977, a live version of the song re-charted with even greater success. Part of Classic Rock Review’s celebration of the 40th anniversary of 1973 albums. lynYrd skynYrd – cant really call yourself a classic rock page if ya cant spell the name of the band!!!!!!! Imperfect as we are, we do correct mistakes when discovered. Thanks, Ron.